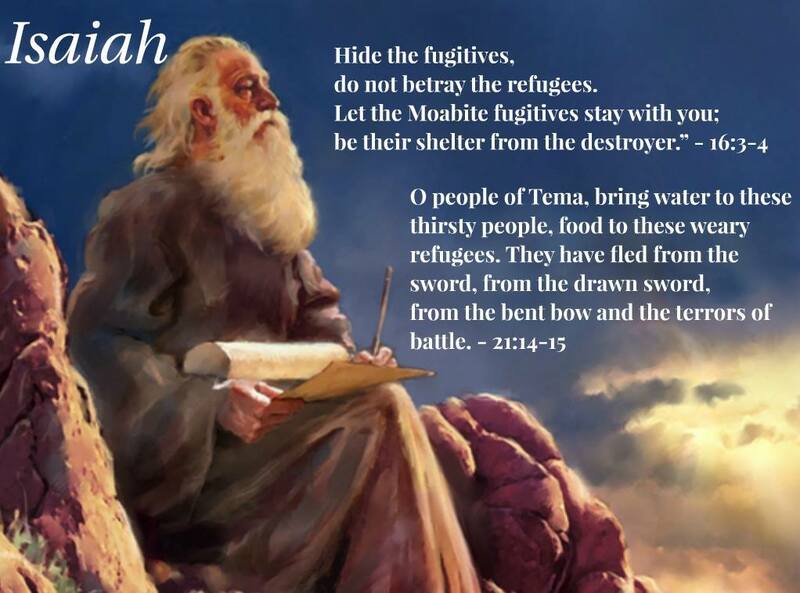 Home » Justice & Economics » Prophet Isaiah (700 BC): Bring Food to the Arab Refugees! It is thus clear that even though this catastrophe is described as being the result of God’s judgment due to the idolatry of the Moabite people, He still cares for them and wants people to give them shelter from the ones who destroy them. Even people who do not worship the Lord still deserves love, care and humanitarian aid. A prophecy against Arabia: You caravans of Dedanites, who camp in the thickets of Arabia, bring water for the thirsty; you who live in Tema, bring food for the fugitives. They flee from the sword, from the drawn sword, from the bent bow and from the heat of battle. Again, this is a prophetic warning about the upcoming war that will strike the Arab people, but still the point that Isaiah makes is clearly that when disaster comes, refugees should be given help and refuge. He does not want innocent refugees to suffer and die, and so his prophecy is a forewarning to Dedanite caravans as much as it is a prophecy of judgment against Arabia. It is important to remember that in Biblical times, passports, border controls and deportations hardly existed. Nations didn’t “choose” to receive immigrants or not, there was no distinction between “legal” or “illegal” immigration just as there is no distinction between legal and illegal rain. In a world with poverty and war migrants will unavoidably move to safer and richer nations. The Biblical response then, is to provide shelter, food and the Gospel to those seeking refuge. This is a contribution to the MennoNerds synchro-blog on the refugee crisis. By Micael Grenholm in Justice & Economics, Peace & Politics on September 8, 2015 . Again, there is no comparison between the highly political refugee situation of 2015 involving millions and the refugee situation 2700 years ago. Back then, there was no evidence of political/ religious undermining of the host country. Taking millions of Arab muslims into European countries will be the death of those European countries. The muslims will NEVER assimilate and will kill any of their own muslims who would convert to Christianity. Also, Christianity is in such a steep decline in Europe…who will step up to do all this converting? Muslims will kill for islam. Christians are embarrassed to step up. No contest. Back in the Biblical days, those refugees were just trying to survive and had no intention to undermine the religion and culture of the host country.. The only answer for the flood of refugees is to stop the CAUSE of the refugees fleeing….ISIS, Taliban, Iran, etc. must be destroyed. Then there would not be ANY refugees. Brother, for a long time I have been tolerant with your hateful comments, for too long in fact. But I’ve had enough. I cannot wrote anything about compassion and love without you spreading hate and prejudice in the comment section. It’s not healthy. So I will block you from commenting, feel free to continue reading though. Hopefully the Lord will change your heart.